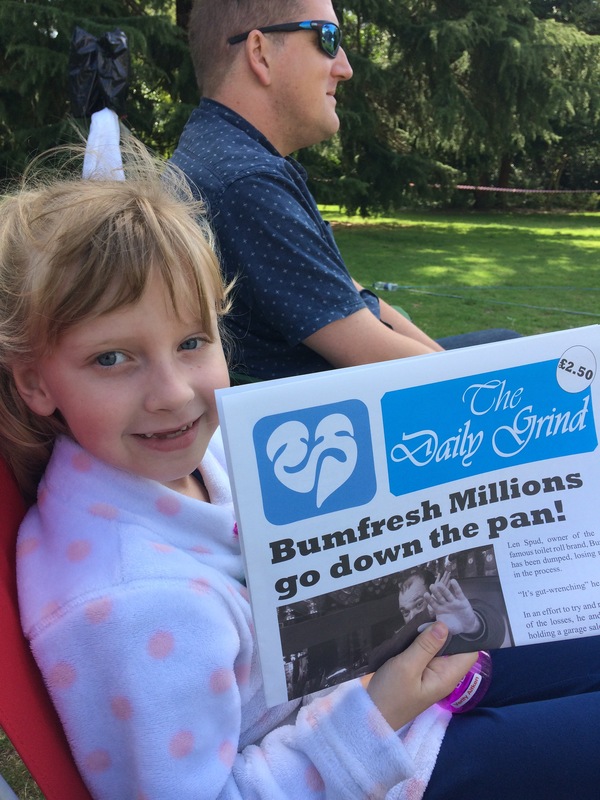 You genuinely can’t beat a bit of outdoor theatre in the summer and Heartbreak Productions’ adaptation of a favourite David Walliams story did everything to make it a really engaging performance, making everybody feel they were part of the show without embarrassing them! Len Spud – the owner of Bumfresh toilet roll – greeted us and soon all the other characters were welcoming and chatting to the audience. Raj the sweetshop owner had a real life sweet stall set up and other characters sold us programmes in the style of the local paper. It made us all feel part of the show right from the moment we walked into the performance area. And just the mere mention of Bumfresh is enough to make anyone smile – even cynical old me! Just five actors played Joe Spud, his dad Len, friend Bob, Raj, the high-maintenance model Sapphire and a whole host of other characters. It was never glossed over that the same actor was playing another character and often this acknowledgement was made with great comic effect. As Len rises from rags to riches – and back down again – they all give energetic and enthusiastic performances. Like the book there’s lots of humour, mixed with comedy songs and general silliness. Some of the audience even get on the stage and at the end everybody learns a dance. The action takes place in the round on a simple set which leads to the words being the most important thing and it’s cleverly directed so that you don’t miss a thing wherever you’re sitting. Amongst all the fun, there’s also a valuable lesson to be learned as Len and Joe encounter a whole heap of trouble from their billionaire lifestyle – money doesn’t buy us happiness and friends and family are the most important thing. We all know this obviously , but it does us good to be reminded of it every so often – in a fun way!